For some reason your blog post was published on Lxer, so I happened to see it. “rokytnji” who replied in your Linux Questions thread pretty much answered this already, in a roundabout way. The short answer is, that none of the Baytrail Chromebooks support native Linux boot OOTB but they can be made to do it, quite easily, by removing the Chromebook’s write-protect screw and running a script. This will remove your ability to run ChromeOS natively. That can however be changed back, quite easily, by running the same script again, and choosing the option to restore the stock BOOT_STUB. This is quite an advanced topic, so I would invite you to read and try to understand the surrounding documentation on my site and on the G+ community before you flash, so you have some idea of what’s going on, and what the risks are. Incidentally, searching for “chromebook firmware”, “chromebook RW_LEGACY” or “chromebook legacy boot”, all come up with links to my site in the top five. I only come up on page 2 for “chromebook boot linux” though. Still, this stuff should be reasonably easy to find, and thousands of other people already have. FTR, the Thinkpad 11e (boardname glimmer) has been supported by my script for a couple of months, and is now 1 of 33 models supported by it. HTH. Thanks for your comment. I definitely checked out your page after reading rokytnji’s comment on my LinuxQuestions post. I was hoping to be able to maintain ChromeOS and also run Fedora installed on an SD card without removing that screw or flashing a different rom, but I would definitely defer to your expertise indicating that is the only way since you have so much experience. I’ll have to spend some time on your site and the G+ community as you suggested to make sure I understand the process and risks fully before attempting. I use DuckDuckGo as my search engine of choice, which may explain why I didn’t find your page on my own right away. Looks like your page appears higher on Google’s listings for a couple of those search terms. 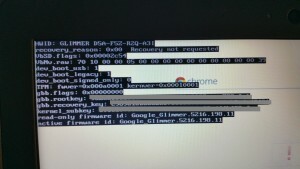 Changing your Chromebook to boot to Linux is in the realm of hacking (actual hacking, that is not ‘cracking,’ which is the computer geek word for what they call ‘hacking’ in the movies) and is never supported by the manufacturer, so there is no point in going to them for help. It’s basically a courtesy by Google and Intel to build in legacy boot capability in Intel based Chromebooks (though these new Baytrail chips aren’t really supported even at that level like the one in my HP Chromebook 14). The manufacturers want no part of supporting something like this. I’ve removed the write-protect screw in my Chromebook to make the change to Linux more permanent (though still reversible, technically), so I probably wouldn’t hesitate to switch one like yours over as well, even though you have to go further to make yours work at all. Just understand the risks and, if you choose to go ahead, follow the directions very carefully. Hi CFWhitman, thanks for commenting. I was not super hopeful when I called up Lenovo, but I figured I should at least try as part of my own due diligence. I can understand why manufacturers wouldn’t want to support anything other than their official products used as intended. I’m kicking myself for not just getting an Acer C720, as it looks like the process would’ve been much easier. I let flashy looking hardware and a good deal sway me. Good to see that it’s still possible to get Linux working on the device, just also looks like more challenging work than I had originally hoped. I like a good challenge though. Okay, well in your case, the obvious thing to do is install Fedora on your SD card and then install one of Arnold The Bat’s ChromiumOS builds to the eMMC (assuming it will work – I’ve only tried that with more traditional HD/SSD). You can then use a script to update it to full blown ChromeOS. 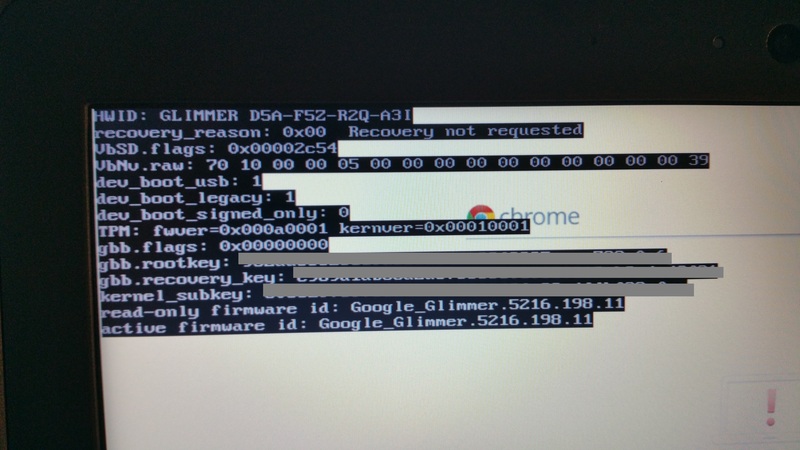 By default, the modified BOOT_STUB I’ve created for that Chromebook will attempt to boot from SD first, if it finds it. So, you can either choose which OS you boot by leaving in or out the SD card, or use the bootmenu from SeaBIOS to select the eMMC. Well, I’ve got to like DuckDuckGo’s attitude towards privacy, etc, but then part of what I do is to search for things, and I’m afraid Google is just quite a bit better at coming up with the goods, unfortunately. Being optimized for Google would definitely be the way to go. I hadn’t heard about being able to flip from Chromium OS to ChromeOS, but I like the sound of that option as well. You’ve been a wealth of information to me, I can’t thank you enough. I’m definitely going to study up the info on your website as well as the G+ community so that I’ll know what I’m doing (hopefully) when it’s time for me to undertake the process. I’m assuming that there is some reason you would rather not use Crouton to run Linux from within ChromeOS. If I were interested in keeping ChromeOS, I might have done that, since it is the easiest way to get both systems running. I could be wrong on this, but to me it looks like if you install Linux within ChromeOS using Crouton, you have to use Ubuntu. Like I said, I could be wrong on that. My preference is to use Fedora if possible. Another thing that keeps me away from using Crouton is just filling up the hard drive. Maybe my concern there is unfounded as well. I’ll have to do more research on Crouton to make sure I’m not mis-perceiving how it works, but all the articles I read in the past showed Ubuntu or Xubuntu, not terrible but I’m a Fedora guy. I’m no longer with Lenovo but I was the Lenovo Product Mgr for the 11e. So the only way to use Linux is to hack it. Google locked down the OS and also designed the system board to prevent using another OS. Thanks for your insights. I ended up using the method John prescribes in his comments and on his website, johnlewis.ie, to get Fedora to boot and install on my SD Card. My next effort will be to check out the Chromium OS builds from Arnold the Bat as John also recommended. Can’t thank John enough for his work creating custom Chromebook firmware. Soon when I have everything working as desired, I’ll do a follow-up post. Thanks Russell for posting this. I also have the same Chromebook and have been wondering how to install Linux. I’m looking forward to your follow-up post. Hi, I have the same model. do you have any tips before I proceed with the process? Have you located the flash chip anywhere on the 11e in case of failure? I replied to Lyoko via email, but for anybody else who might be reading, I followed John’s instructions on his website johnlewis.ie and succeeded completely in flashing SeaBIOS and installing Fedora on an SD card. Everything works as far as I’ve been able to tell over the last month and a half or so of use. Sound works, internet works. THe only thing I’d mention, and this is covered on John’s site, is that when SeaBIOS displays, you want to hit the ESC key to get the boot menu just once, when instructed to do so. Early on, I made the mistake of hammering the key repeatedly and had to keep connecting to an external keyboard to get it to work. As long as you’re patient with SeaBIOS and hit ESC when instructed to do so, you’ll get your boot menu and be able to choose the desired device to boot. From Fedora, I was able to locate the built in flash chip under GParted, and I could see the Chrome OS installation on there, which is not bootable under SeaBIOS. Per John’s other comments, I downloaded a copy of Arnold the Bat’s Chromium OS build, and was able to use the dd command to write the image to the internal flash card after deleting the unbootable Chrome OS partitions that came from the factory. I’m still working out the kinks on Chromium OS. I found that that with the daily build, I couldn’t connect to the internet, my wireless card wasn’t detected. I switched to one of the “special” builds and re-installed. I’m able to get online, and boot into Chromium OS and use it, minus sound at this point. Still trying to iron that out, but decent progress. Netflix doesn’t work either, even without sound, which isn’t unexpected on Chromium OS. I’d like to get both of those working, but sound and Netflix both work for me under Fedora, and I doubt I’ll use Chromium OS much, just nice to know it’s there. Thanks again to John for all his work and assistance. Does it still disable the keyboard when in tablet/presentation mode? Yes. The ThinkPad Yoga 11e disables the keyboard when rotated past 180degrees. Does the accelerometer work? Or is stuck in a specific orientation? The accelerometer works to determine the mode you are working to autorotate your screen. The 11e doesn’t have a screen lock button like the more expensive Yoga 12, Yoga260 or X1Yoga models. If it sticks just change the mode to get the screen to change then go back to the mode you wish. Hi, we would like to feature your blog post on http://www.themostboringblogpostsever.com. Can you reach out to me? i dont know if this will be helpfull but the hotkey for CROSH (Chrome developer shell) is Ctrl-Alt-t.